Yves Morizot founded Stand 21 in 1970. Stand 21 has since, continuously delivered technical innovations, safety improvements applied to its products, exceptionally efficient and comfortable. Production of racing equipment by direct mail-order sales. Introduction of “made-to-measure” racing suits and first Formula 1 involvement. Introduction of preformed arms and back on racing suits. Establishment of exclusive worldwide distribution network. The ST021, a new generation of racing suits with multidirectional floating sleeves concept, an invention copied by all our competitors. Design and production of comfort improving stretchable collar. Introduction of a new, SNELL SA-certified helmet. Production of the first Air Force vented racing suit. 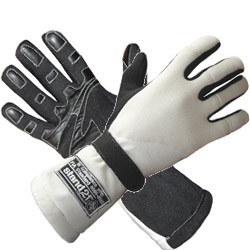 Introduction of first-ever outside-seam gloves (developed with Senna, Piquet...) and flat-seam balaclava (head sock). Selected as one of only two worldwide HANS® licensees, to engineer, produce and market head and neck restraining devices, resulting in the development of many new HANS® models. Establishment of Stand 21 India to fully integrate all production in house, and develop new product lines. Completion of the "Heat Stress” research program in close association with medical experts worldwide and the French Army. A new ST3000 racing suit is the result of the Heat Stress research, using a new, ground-breaking Pairformance® fiber. Development of the Heat Stress concept with many customers, Porsche Motorsport, Corvette Racing, HSV… Stand 21 establishes in India, a shoe-manufacturing factory allowing full customization. Stand 21 becomes Porsche Motorsport’s Official & Exclusive Worldwide racewear supplier. Introduction of an improved Air Force racing suit. Introduction of the Stand 21 IVOS® helmet. Introduction of a new FHR Racing Series. All Stand 21 racing suits will now feature Heat Stress technology. Introduction of the IVOS®-Open Face Double Duty helmet & fire-retardant woman brassiere. Introducing the FHR Ultimate and the Top Fit head sock. Introducing the Lid Lifter head sock, the La Couture, ST221 HSC Evo & ST221 Air-S racing suits, the T221 & T215 mechanics suits, the Top Fit underwear top and pants, the Silhouette shoes, the mechanics gloves and the new pants. Introducing the T121 technical staff suit. Introducing the IVOS Global Air Force helmet. Introducing the La Couture Hybrid racing suit. Introducing the Air-S Speed shoes. Porsche Motorsport collection new design.